For mobile users who require tasks, information or status updates asynchronously without requiring to explicitly request it, by for example pressing a refresh button, Red Hat MAP provides a very useful built in MBaaS service for this purpose – the Sync framework. This framework makes it possible to keep a mobile app in sync with data modifications made on the server and vice versa, hence keeping two separate data stores synchronized, albeit not in real time. For personnel who work according to a semi-automated process where certain tasks are performed manually, such as collecting data from a customer or traveling to a work site, Red Hat JBoss BPM Suite together with Red Hat MAP provide an excellent means to combine these needs. Task data retrieved from Red Hat JBoss BPM Suite can be displayed for example as cards in the mobile app. The end user can interact with Red Hat JBoss BPM Suite through the mobile app by releasing, starting or completing tasks. and thus advance the process to the next step. 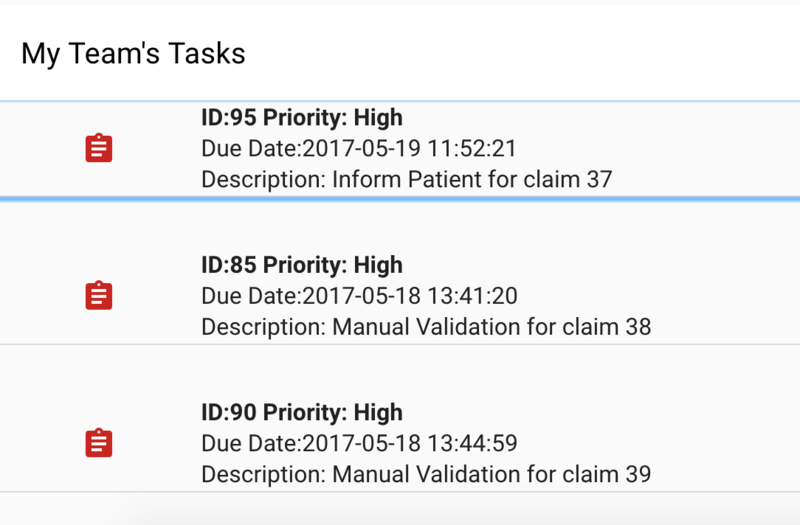 The Mobile App can display an in-queue that gets updated when a process running in Red Hat JBoss BPM Suite creates new tasks. New tasks that are not already claimed by anyone will get pushed to the mobile app through the Sync framework and be presented in a scrollable list. 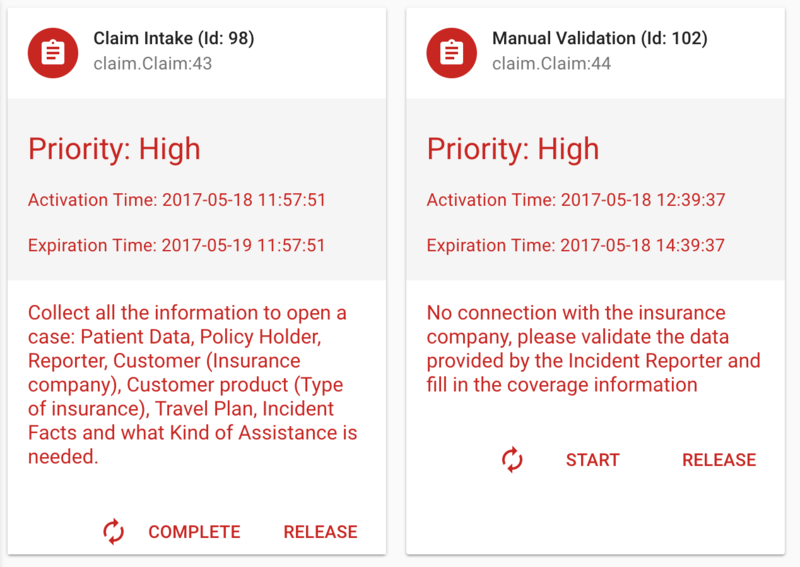 Hence, a team of users can use Red Hat JBoss BPM Suite’s claim function through the mobile app to manually reserve a task to work on. This will remove the task from the in queue until it’s either completed or released back to the queue. All of these operations on the task can be made through the mobile app. the $fh.sync framework is used together with the fh-connector-bpm. Using the $fh.sync.globalInterceptRequest function with a globalRequestInterceptor that calls the connector on each sync cycle and then stores the result in a Mongo DB collection allows the mobile app to asynchronously retrieve the latest Red Hat JBoss BPM Suite process and task updates and present these to the user. // This function will intercept all sync requests. Note that in order to reduce amount of data to be retrieved by the mobile app, all updates should be made to the same document, hence, overwriting the previous update. With this, the mobile app can use the $fh.sync API with the collection name as dataset Id and subscribe to updates in Red Hat JBoss BPM Suite process instances and tasks. // Unique Id of the record, used for read, update & delete operations (string). // Record data, opaque to sync service. infrequently receiving new tasks to an in queue. 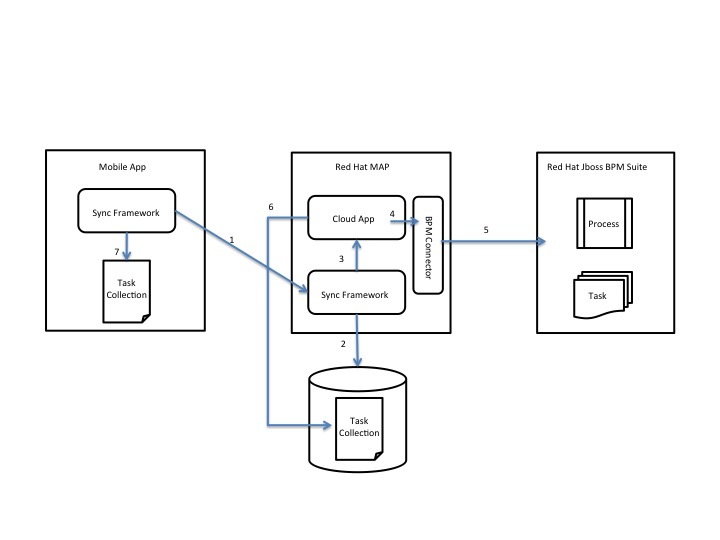 Red Hat MAP together with Red Hat JBoss BPM Suite, leveraging the sync framework provide a simple way of building process driven, asynchronous mobile apps that can be used by mobile personnel.